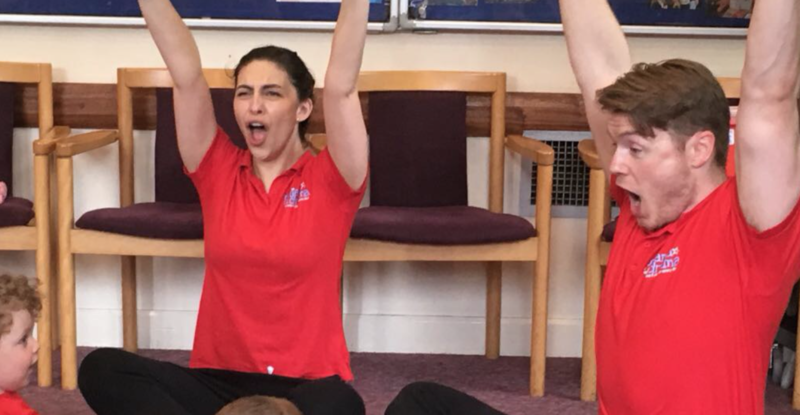 Blog | Drama Classes For Kids | Child Education Franchise - Could it be you? My wife and I are both actors and wanted to start a business of our own, one that would use our skill base; pulling funny faces, jumping up and down, using funny voices - that sort of thing! But we also wanted to run a business that made a difference. Knowing we didn’t have the time or experience to set up our own business from scratch, we decided to look into franchising options. After talking to Rachel from Head Office, discussing exactly how joining the team would work, what our financial situation would be, and how much support we would be able to benefit from, we decided to take the plunge! We managed to get the initial purchasing amount (I heroically cancelled Sky Sports!) and got ready to go to training. It was at this point while in a lovely bed and breakfast in Welshpool, that I had a rather important realization - I (unlike my wife) had zero experience teaching children, and was about to be thrown in at the deep end, delivering a Pyjama Drama class before the week was out! Luckily this didn’t matter – the training given by Sarah and Rachel was fantastic. After two days of practical training I had the skills, knowledge and just enough confidence to give it a go! I know you may think it should have been easy for a trained actor to deliver a Pyjama Drama session – but no-one prepares you for how different it is to be working with preschoolers and being responsible for igniting their imaginations and taking them with you to imaginary worlds! With the support of my wife and the Head Office team I ran my first session on day three and absolutely LOVED it! After a further three days of business, marketing, administration and more practical training, we headed back to Guildford feeling ready to take the nursery scene by storm! We had a plan in place, ideas in our pockets and were ready to go! We made lots of phone calls, sent lots of emails and wandered around town in our branded T-shirts enthusiastically explaining all about Pyjama Drama to anyone who showed a passing interest. The strategy we devised during training week seemed to be working, and we soon started booking sessions for the term. The freedom to tweak and adapt the sessions slightly to suit our style was very useful, and meant we could put our own stamp on the classes and feel really confident every time we went to teach. We enjoyed the freedom to set our own schedule and be in charge of our own working hours. We were careful to make sure that all of the teaching in our schedule could be done by just one person just in case life happened (baby-wise!). The schedule grew nice and quickly and we were soon fully up and running. We had lots of encouragement to try and reach our potential, but not any pressure weighing us down. We focused on building a strong Facebook presence (luckily my wife took charge of this, as I’m not the most Facebook savvy) which gave us a direct line to the parents of the children in our area and our business continued, with lots of hard work and dedication, to go from strength to strength. It has been a whirlwind of a year and we have both learnt so much! It is with a heavy heart that we have to leave our franchise and put it up for sale due to relocating ‘up North’, but I can confidently say that we will be carrying all of the brilliant things we have learnt forward with us. Running a Pyjama Drama business has been a wonderful way to experience what it’s like to run our own business but with the support of Sarah and Rachel at Head Office to guide us where needed. If you think you could be the right person to continue the running of Pyjama Drama Guildford & Surrey Hills, please email me (anthony@pyjamadrama.com) and I’ll send you more details! Until then – have fun!